Flood damage is a serious problem for many homeowners. It can be very destructive, is a hassle to clean up, and poses certain safety concerns. We at Ally1 in the St. George area want you to be safe and prepared in all types of flooding disasters. Below are five safety concerns associated with flooding that every homeowner should be aware of. It is no secret that flooding can structurally damage homes. However, this damage can be even more dangerous when it isn’t very visible. This can lead to the possibility of your home collapsing in at any time without you being aware of it. It is best to have your home inspected by a professional after a flood so they can determine if your home is still structurally sound. Mold is a very common problem that develops after a flood. 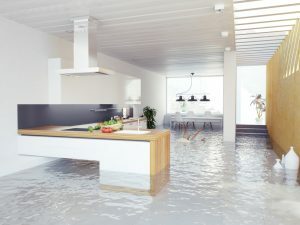 This is due to the fact that a flood spreads moisture throughout your entire home and that it is very difficult to identify and remove all that moisture. Mold spores are typically not extremely dangerous, but they can cause irritation and respiratory problems, especially for those with weak immune systems. The best way to prevent this is to begin the cleanup and restoration process as soon as possible. Moisture attracts many insects and other undesired pests. Thus, if you have a flood you should be on the lookout for any of these invading your home. Some of the most common insects are earwigs, ants, and cockroaches. Mice, rats, and snakes are other creatures that are commonly found in homes after floods. After a major flood, you should not eat or drink anything that is in your house until it can be determined for sure that they were not contaminated by the flood water. Flood water often carries harmful bacteria and microorganisms that, if ingested, can lead to serious diseases like cholera, typhoid fever, and diphtheria. It is always better to be safe than sorry in this regard and to wait to eat or drink anything in your home until you know it is safe to do so. All in all, floods are a serious type of disaster that should not be taken lightly. The influence of a flood extends far beyond the initial damage it causes. There are many different dangers that a flood creates for you after the fact. These include electrocution, unseen structural damage, mold, unwanted pests, and contaminated food and water. If your home is flooded, don’t hesitate to give us a call at Ally1 in the St. George area to help you get your home restored back to normal and keep you safe in the process.